The new Heroes and Legends, featuring the U.S. Astronaut Hall of Fame, at NASA's Kennedy Space Center Visitor Complex in Florida will include videos shared by the public on social media. NASA wants to put you in the new U.S. Astronaut Hall of Fame. This fall, NASA's Kennedy Space Center Visitor Complex in Florida will open "Heroes & Legends, Featuring the U.S. Astronaut Hall of Fame," a new attraction that replaces the original Hall's museum, which opened in 1990, with an immersive experience that will introduce guests to the American men and women who pioneered the space frontier. Heroes & Legends will include the almost 100 astronauts who have been inducted into the Hall of Fame. Those space explorers are considered heroes to many people and their spaceflights the stuff of modern-day legends, but to place their roles into context, the visitor complex is seeking the public's input. "Who is your hero?" the complex's website asks. "Heroes come from all walks of life. Whether your hero is a teacher, friend, cultural figure, parent or pet, here is your chance to tell the world how they have inspired you. In ways both large and small, heroes make the world a better place." A short video shared on social media about a hero that has personally inspired you could end up as part of the new attraction. "Selected submissions will be featured alongside NASA's most famous astronauts and celebrity ambassadors in the new Heroes & Legendsfeaturing the U.S. Astronaut Hall of Fame attraction," officials wrote. "Submitting is easy and anyone can enter!" The public is invited to post their video on a social media platform (Twitter, Facebook, Instagram) using the hashtag #KSCHero. The deadline for submissions is July 31. Scheduled to open on Nov. 11, Heroes & Legends will be the first attraction guests encounter as they come into the visitor complex. The public will enter the new building by way of a sweeping ramp entrance, "simulating a journey to the stars," that features a slingshot maneuver through the center's iconic Rocket Garden of historic launch vehicles. In addition to the Astronaut Hall of Fame itself, Heroes & Legends will feature three distinct experiences. The new attraction Heroes & Legends (bottom left) is seen under construction in this aerial view of the Kennedy Space Center Visitor Complex. In the first experience, a 360-degree discovery bay, guests will explore how society defines heroism from a diverse group of people who address what is a hero, who are the heroes of our time and what does it take to be a hero? During this seven-minute presentation, the space race with the former Soviet Union is explained as the early impetus for America's push to go beyond Earth's atmosphere. A 4D "multisensory experience" will next enable guests to vicariously join the astronauts on the most perilous stages of their adventures. Choreographed lighting and effects — including fog, mist, water spray and wind — will enhance deeply resonant sounds and surrounding images to create the sensation of being "in the moment" as visitors stand on a platform overlooking the planet Earth from orbit. From there, the public will enter an interactive exhibit floor that uses holograms and other interactive media to change the way they have traditionally interacted with artifacts and astronaut memorabilia. A collection of exhibits will describe attributes of a hero, while highlighting more about NASA's astronauts as told through their experiences and personal items. Here guests will be able to see the consoles from NASA's original Mission Control and view astronaut Wally Schirra's "Sigma 7" Mercury capsule as he virtually climbs into the spacecraft. 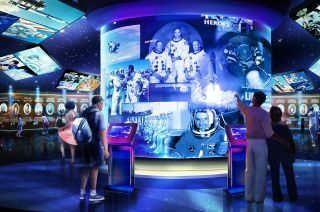 The culminating experience inside Heroes & Legends will be the U.S. Astronaut Hall of Fame. Housed in a rotunda, a 365-degree video cylinder with interactive kiosk stations will provide access to stories about each of the inductees. A signature element the new Hall of Fame will be a photo opportunity, inviting the public to pose with some of those featured inside. Watch a video about the Heroes & Legends "Who is a Hero?" contest at the Kennedy Space Center Visitor Complex.